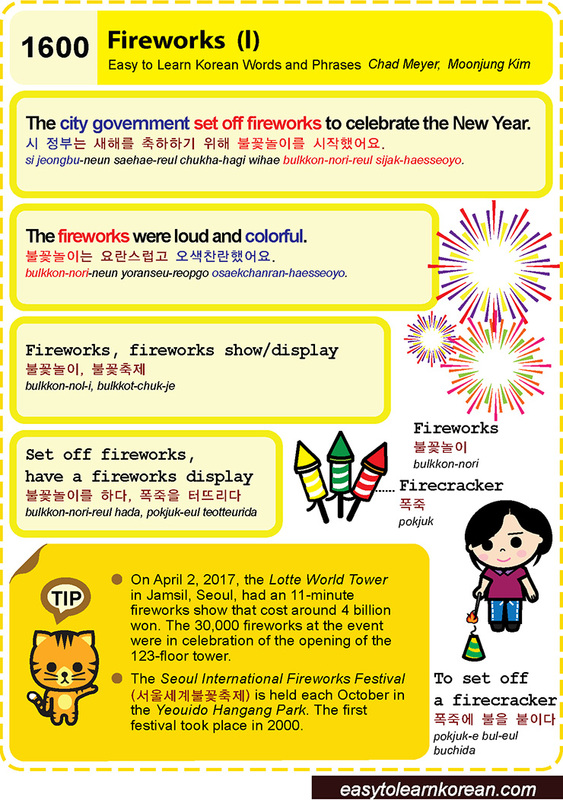 Easy to Learn Korean 1600 – Fireworks (part one). This entry was posted in Series and tagged Festival, firecracker, fireworks, fireworks show/display, have a fireworks display, Jamsil, Lotte World Tower, Seoul International Fireworks Festival, Set off fireworks, The city government set off fireworks to celebrate the New Year., The fireworks were loud and colorful., Yeouido Hangang Park, 불꽃놀이, 불꽃놀이는 요란스럽고 오색찬란했어요., 불꽃놀이를 하다, 불꽃축제, 서울세계불꽃축제, 시 정부는 새해를 축하하기 위해 불꽃놀이를 시작했어요., 폭죽, 폭죽을 터뜨리다 by easykorean. Bookmark the permalink.